Thursday’s blog is something blue. 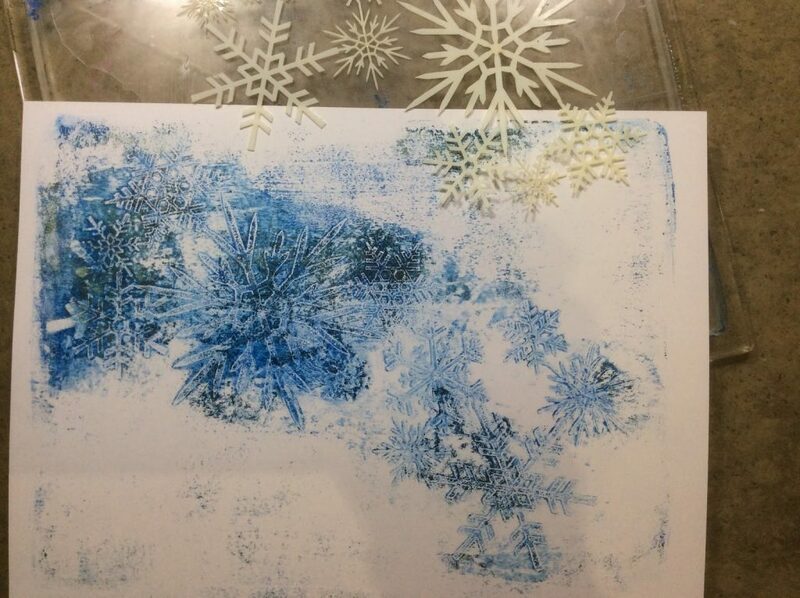 using the Snowflake stencils and some acrylic paint. A year ago, if anybody had said this was worth hanging on to and not for the bin, I would have begged to differ! In the meantime, either my eyesight is on the blink, or I have grasped that white areas and tatty bits are brilliant. 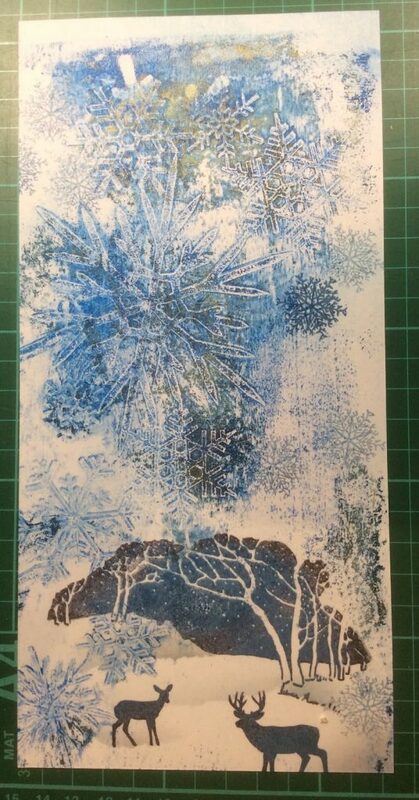 Well, on gelli plate art at least. I’m developing my very own white areas and tatty bits with no assistance from anybody!!! Just MY body!! I made a decision to go tall and trim the card. In artspeak, portrait, not landscape. 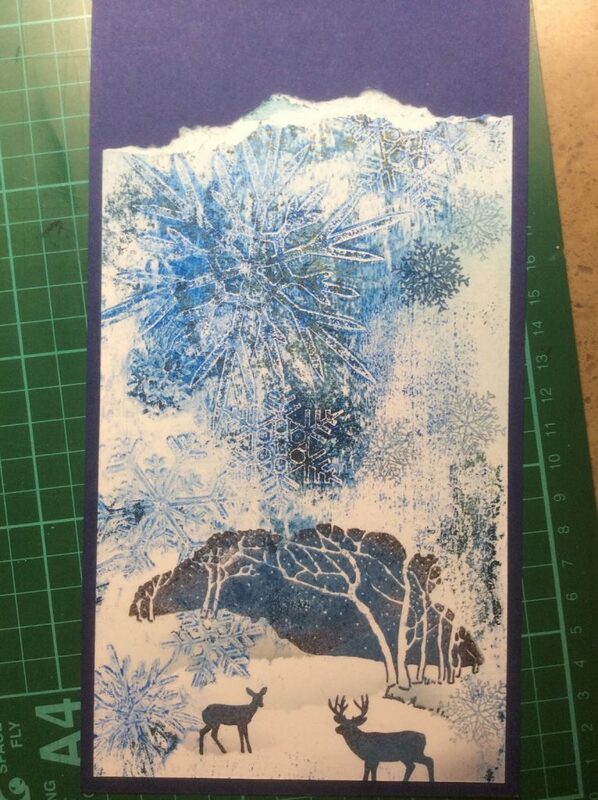 Right down the bottom I stamped the Wonderland scene. 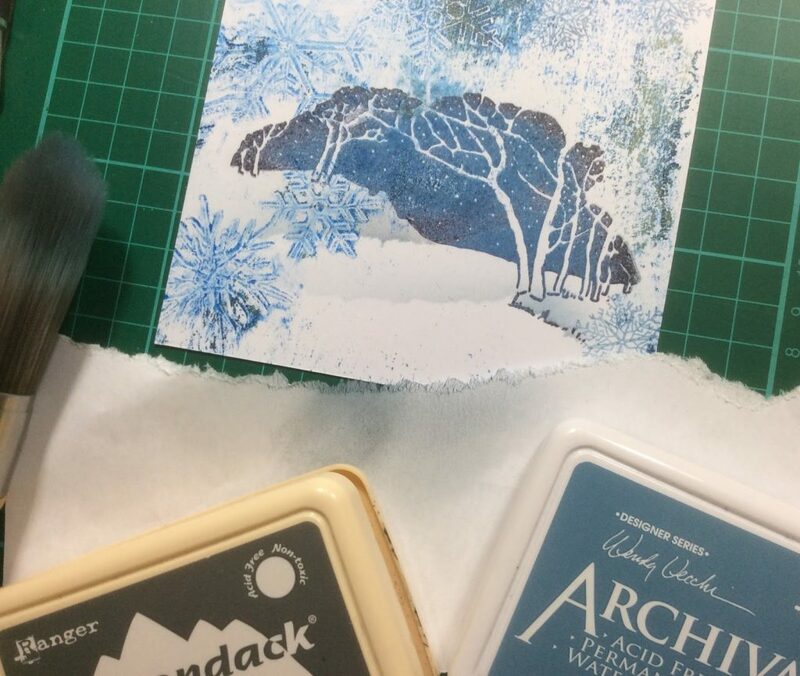 First I inked it up with Cornflower Blue Archival. Then I kissed the edges of the stamp in Black Archival. See how the black frames it? 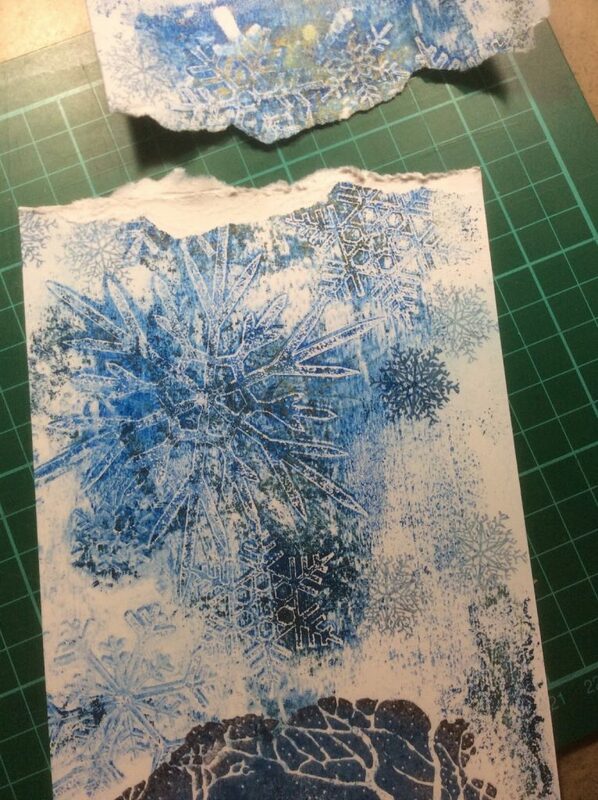 Next I stamped the little snowflake into the patchy white areas, but blotted it first on scrap, i.e. used second generation ink. Did it dark once; decided to go light. and a touch of the Cornflower blue. The stencil brush does the job well. or you can use a make-up sponge for this one. 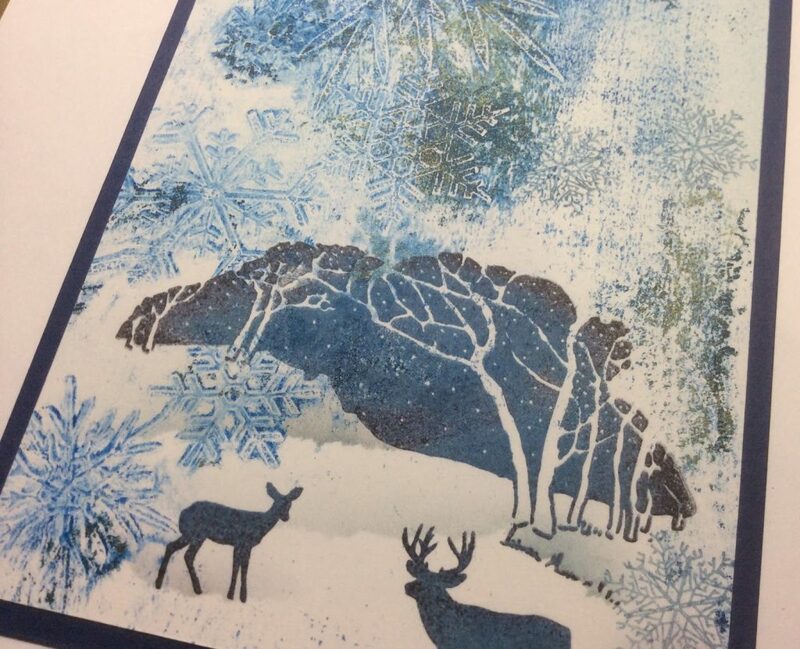 Next came the stag and fawn, in Cornflower Blue. I tapped them in the black Archival lightly too. it lends itself perfectly to tearing the top. Make sure the white frayed part is at the front on the main piece! 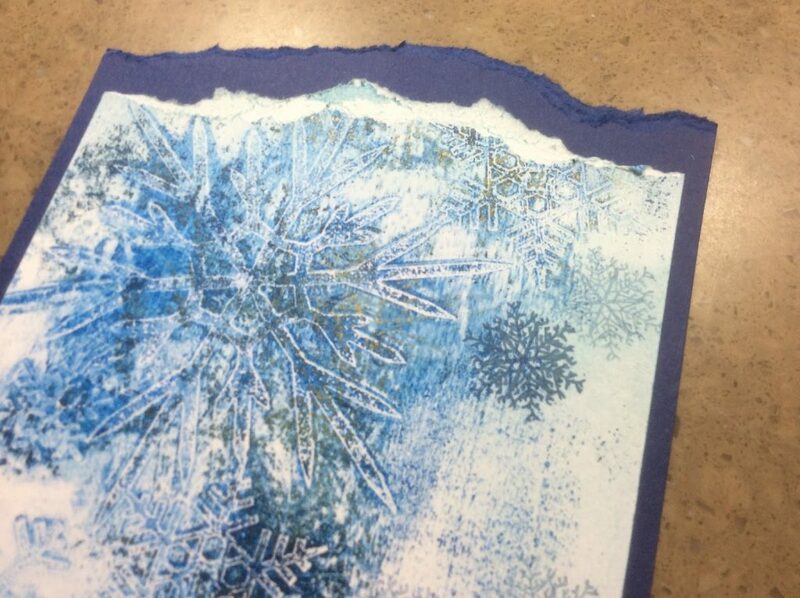 Lay the art on a complimentary colour card, trim it to size leaving to top edge long enough for tearing again. 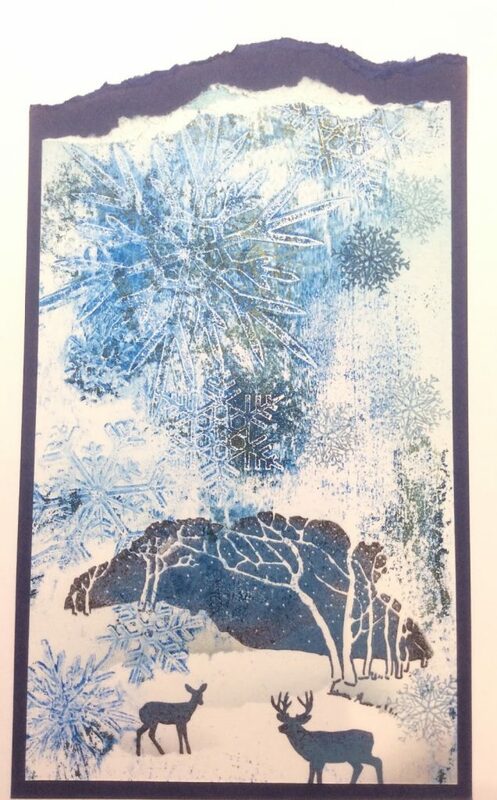 How do I mount the artwork? I use spray mount in a box. No, I don’t get in the box. Tear the underlayer similar and close. Mount on white, and Bob’s your uncle! If you stare at the opening, the dark area, and adjust your mind to the fact that it IS an opening, the artwork changes instantly. to celebrate their wedding anniversary. and some fresh sea air. Let it dry between layers! FAbulous card, and I love how the eye draws you into the dark background in the middle of the card… have a great couple of days away. Enjoy your mini break in Rye. Great card, love the choice of colours. Not chocked by the darker snowflake. Enjoy your time with your parents it's precious time. Hi Barbara. Wonderful card today. 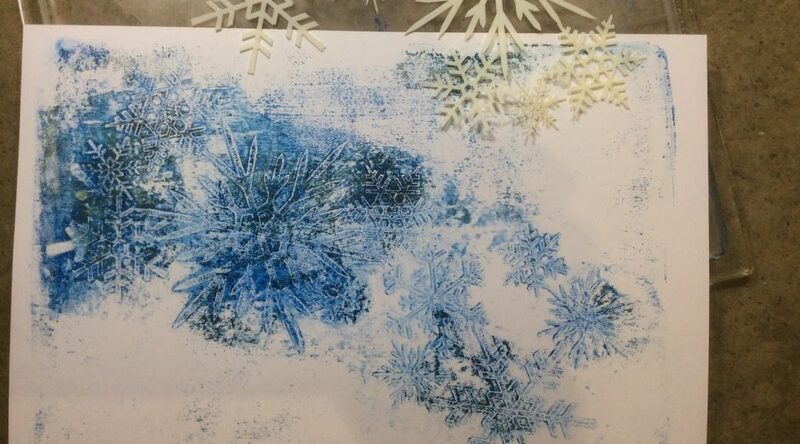 I love how the snowflakes look so icy. Yes, you can really feel the scene opening up when you stare at it. Have a lovely time with your parents and enjoy the sea and fish and chips. They always taste extra tasty when you eat them while sat on the beach don't they. Enjoy. Take care. Beautiful piece today. Just love the frosty, crisp feel. Fish & chips in paper with a little wind chill off the sea …… can't beat it. Enjoy ! Oooh, Barbara, your last comment has made my hungry! Why is it that fish and chips on the coast taste so much better than when you are inland? Congrats to Mum and Dad, and enjoy your break, I think you have earned it. (love the card, by the way, LOL). A lovely piece of artwork and your right you do get drawn into the view. Happy anniversary to your mum and dad, hope you all enjoy time away in Rye. Love this work and Rye is a favorite place enjoy your days off and the celebration!!! 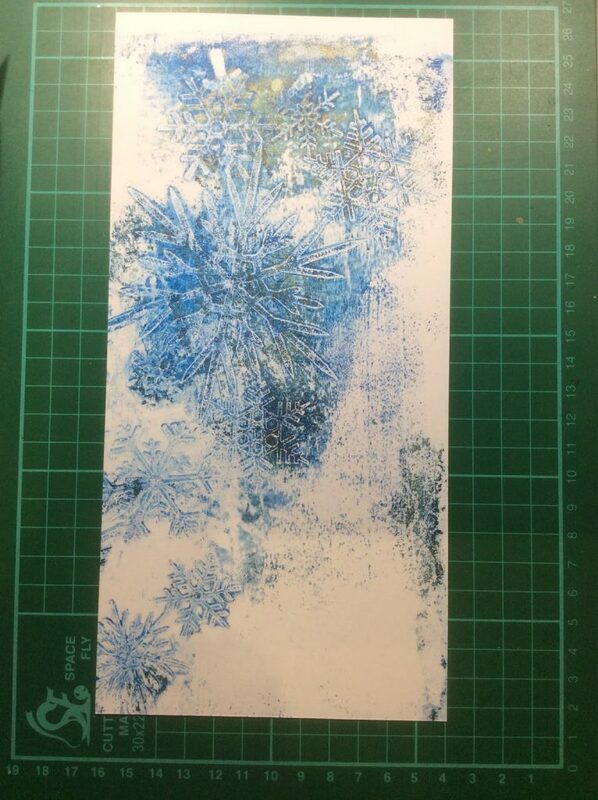 Go careful as not sure all discarded bits should be rescued – my mind is stuck on the snotty tissue my niece proudly handed me a while ago , while telling her friend how her Auntie can make any paper in to pretty flower cards lol! I have always loved this stamp set and love it even more now! 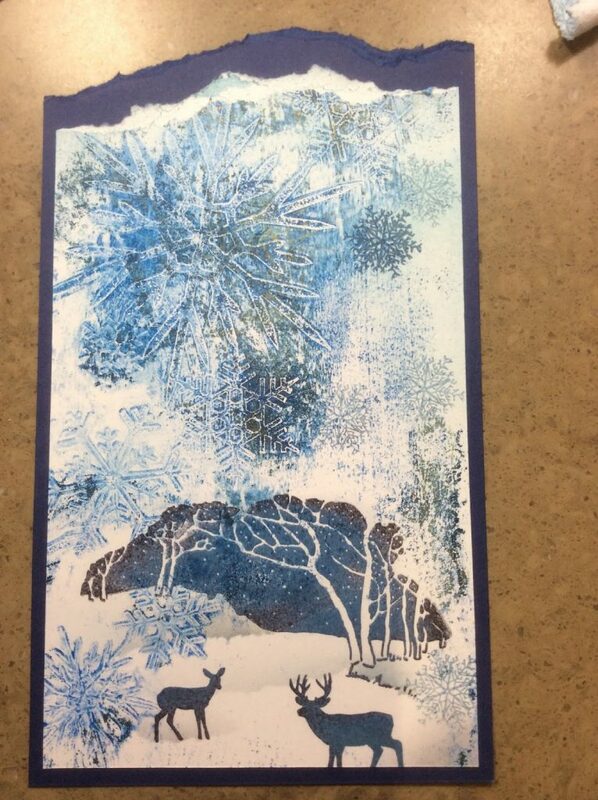 The temp has dropped a little up north, although still beautiful with glimpses of sun but looking at this card has left me feeling the need to pull out my aron jumper and get ready for the frost. This is the beauty of your art, it transports you into the picture. Have a lovely break and congratulations to you parents. 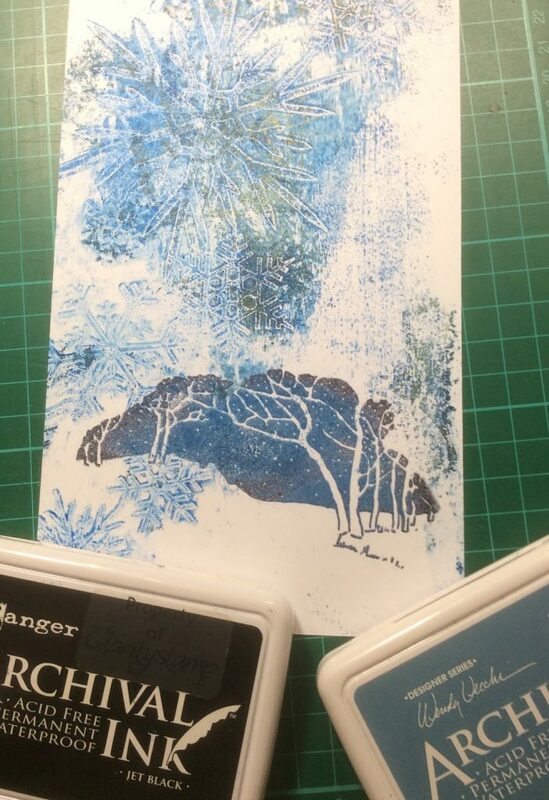 I love blue and I have the stamps you have used and not tried them yet. I am planning a session for tomorrow when I have time to play. Thank you for the inspiration. This is fabulous. When looking t the dark sky the effect is 3D and everything in front just pops out at you. Sooo clever. You'll have had your fish and chips by the time you read this but I hope you ate them outside, and used your fingers!! Although probably your mum and dad would want a "sit down" meal with cutlery. Nothing like eating them outside, soaked with salt and vinegar and the seagulls squawking overhead. Think I'll pop along to Whitley Bay later! Very clever card you can imagine walking into the opening deep into the yonder. oh blogger has just lost my message. b…….. anyway as i was saying i think this is awesome artwork. you have created so much depth and dimension. i could feel myself falling in the darkness if i got too close. brilliant. i love, love, love this. i will borrow idea if you don't mind. 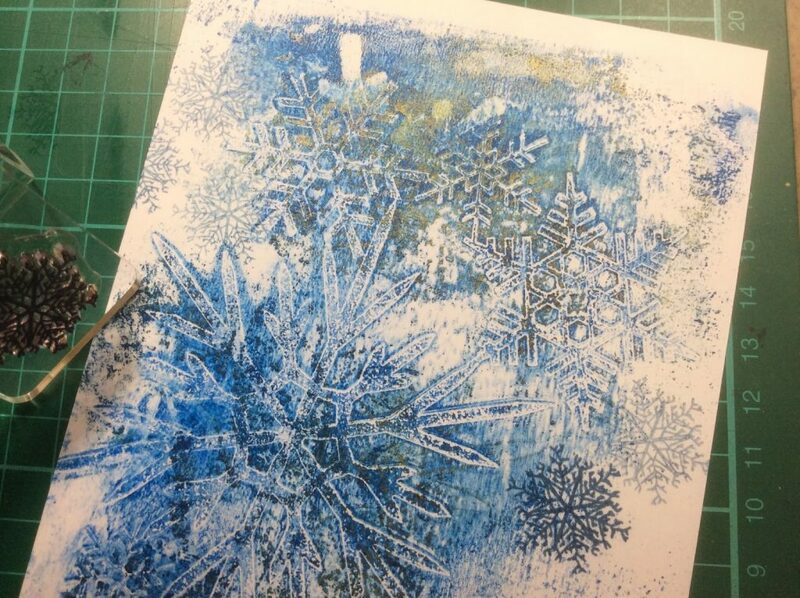 I love tatty white bits, and have learned over the last year not to be so critical of what I create – no one else knows what's in my head which is not such a bad thing! 🙂 I know what you mean though about scrapping things, luckily I'm a bit of a hoarder, so my latest creations have been from bits that have been put on the back-burner….commonly known as scrap! Hope you have a lovely break andcongratulations to your parents. Now fish and chips near the sea is one of the simple pleasures in life and one of my favourites after having a paddle and building a sandcastle or twelve lol! If ever I need to clear my head as things at work have been hard going then this is the perfect pick me up , second only to going to our local country park and flying a kite and having ice-cream ! I am but an over grown child and proud of it ! Anyway I digres – this piece is lovely as so atmospheric , I so must replace my Gelli plate ! How remiss of me Barbara! !, I read the blog on my phone and forgot to leave a comment last night as I find doing it on the phone frequently doesn't work! I love the art – brings to mind the big Montana sky from a road trip through Montana a few years back – it certainly made me look at some of my scraps last night but unfortunately none that matched this! 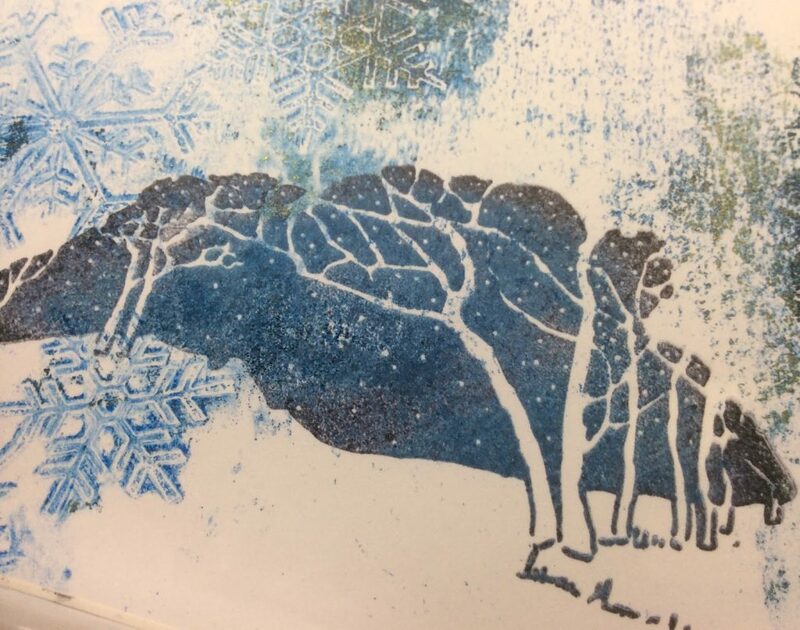 Hope you are having a grand time in Rye – such a lovely place with a lovely coffee shop near the cathedral if you get the time in-between looking at more lino art !!! Congratulations and best wishes to your parents – hope the weather holds for your couple of days away.